Halloween seems to be the talk of the town, and rightly so. From costumes to food to drinks – everything about this holiday seems to incite a different kind of excitement. Yesterday, I shared this web site that has a good selection of pirate costumes that can make you the star of any Halloween party that you go to. If pirates are not your thing and you prefer a time machine that looks like a phone box, then you probably will go for the TARDIS. (I totally understand your sentiment, by the way.) Alternatively, you might want to go with the Daleks. If you are hooked on the Doctor, here’s something that you will definitely want for yourself: TARDIS Prime. (I know I want one!) 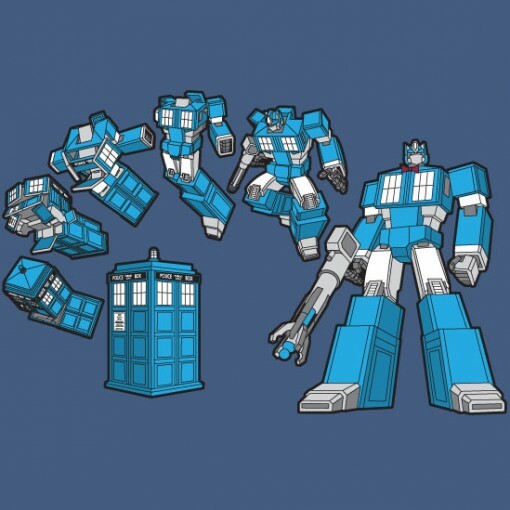 It’s a shirt that celebrates the awesomeness that is the TARDIS, while at the same time incorporating the concept of the Transformers. I don’t think anyone can deny just how formidable that combination can be, do you? The design was created by Jason Casteel, who says that the idea came from his brother. Apparently, his brother was just discussing with his colleagues about how a TARDIS costume would be perfect for Halloween. Inadvertently, the Transformers also entered the discussion. Looks like Jason is a curious lad, if anything, as he just had to see how the mashup would look. The result? TARDIS Prime. And boy, does it look good! Here is the design again, this time on t-shirts for men and women. You can get your hands on this t-shirt in the next two days or so. For only $10, you can have a t-shirt that will certainly earn you some geek cred. At least from Doctor Who geeks. Head over to Graphic Lab Design to place your order now! The t-shirts come in varying sizes, from small to 3X. As can be expected, you have to add a few dollars for the large sizes.